“Ambigram” is a general term for textual images which can be viewed in more than one way. This page includes only rotational ambigrams — which can be read both right side up and upside down — however there are many more types. Reflective ambigrams can be read in a mirror, and shift ambigrams can be read differently just by thinking about them a different way. I believe that I first came across ambigrams in Martin Gardner’s book “Perplexing Puzzles and Tantalizing Teasers” which we had around the house when I was small. I only recently decided to try making my own, the results of which are below. Note that since I’m not exactly a graphic designer the results aren’t up to par with, say, John Langdon’s or Brett Gilbert’s>. 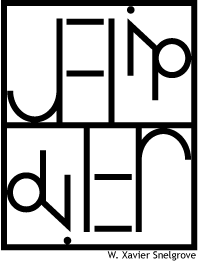 I found a good starting point for making these was the ambigram-matic generator; my “Xavier” ambigram is similar to the one generated there. For other words it is not quite that simple; the ambigram-matic does not do ligatures. 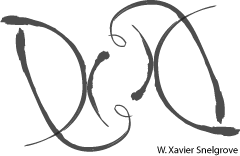 In the “Sylvia” ambigram, for instance, the rotated ‘y’ produces both the ‘l’ and the ‘v’. I don’t have a system for those more complex cases, instead I just doodle for a while until it starts to look good. The name Dix, which is a nickname for Richard (above). 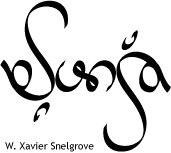 The name Sylvia, this one is a "chain" ambigram, it does not work when the name stands alone, but rather you need a repeating sequence. The name Anne, I admit I didn't do very much for this one. It's essentially exactly the word "Anne" written in the Marker Felt font. I did, however, slightly modify the 'a' letterform to make it look more like an 'e' when flipped. For my friend Claire. 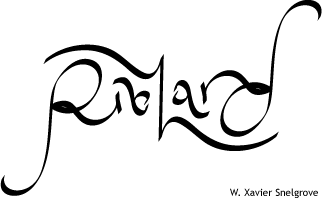 This is another "chain" ambigram. For my friend Sonja. I think this one turned out nicely. This one says "Flip Over". I'm not sure how legible it is; personally I can read it quite easily but I've been staring at it for too long so can't really judge. I like that it's in a different style to the other ones.